You make an investment in every person you hire. People who drive your vehicles are more than just employees – they are public representatives of your brand. It is essential to employ safe and courteous drivers you can trust. We recommend a background screening package that includes a comprehensive criminal records check and 5 panel drug test. We also suggest annual screenings for all active drivers. They show if someone incurs a new traffic violation, criminal record or anything else that might make them ineligible for ongoing employment. Every driver presents a risk to other motorists. The way they handle themselves on the job directly impacts the safety of others. That's why the transportation industry faces a strict set of regulations. It is imperative for your business to remain compliant with these laws, and to hire reliable people with solid driving records. We offer Custom Background Checks that can be tailored to your specifications and we make it easy to save custom packages so you can use them again for future candidates. The Transportation Industry has an ongoing need for drivers that can increase dramatically on a seasonal basis. That’s why it is crucial to make the best possible hiring choices every time. There are expenses for interviewing, training and simply getting your employees on the road. 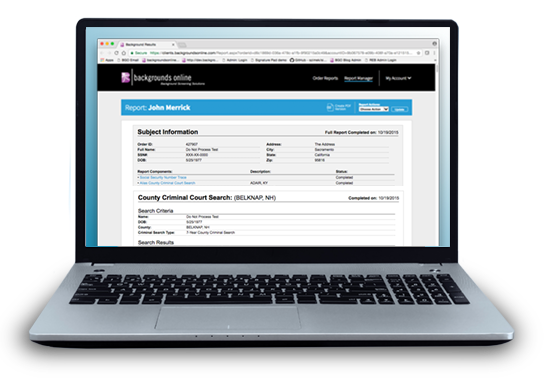 A background check helps you find reliable people with clean records. Use them when you're looking for long-term drivers who will save you money by reducing turnover rates. To help protect the general public, there are numerous regulations that govern the transportation industry. It is critical to make sure your hiring is done in a compliant and consistent manner. Creating guidelines for your screening practices will help ensure compliance and consistency throughout your hiring process. It’s worthwhile to review your documentation periodically, and make changes based on new laws or internal policies. Backgrounds Online is FCRA certified. We are highly experienced at building background checks that can be used for hiring purposes. When you're ready to start screening, turn to us for pre-set screening packages or Custom Background Checks. What can I learn with a Motor Vehicle Record Search? Get a Motor Vehicle Record Search for any applicant who will drive a standard or commercial vehicle. Should I screen my drivers annually? A: We recommend annual screenings for all drivers. They show you if a driver has a new infraction or conviction on their record. Start annual screenings to verify that your employees remain eligible for ongoing employment. How often should I drug test the drivers? A: We recommend screening all drivers annually. Backgrounds Online will schedule 5, 10 or 14 panel screenings via our partner, Quest Diagnostics. If you would like to start annual drug screens, contact us for assistance. A: You are not legally required to run background checks on administrative personnel, but they will help you find the most qualified candidates and remain compliant with FCRA and state regulations. It is important to screen applicants for every position, so you can verify their identity, see their employment history and get relevant facts about them before making a hire/no-hire decision. When hiring drivers, plan for safety and long-term effectiveness by screening your applicants to find the most qualified individuals.